This post brought to you by HUGGIES. All opinions are 100% mine. Isabella was an EXTREMELY active baby. She rolling around at three weeks, crawling at five months and walking at nine months. There was nothing I could do to stop her from getting to point A to point B in .00005 milliseconds (okay, that's an exaggeration). However, there was something that I could do to prevent her from getting injured. In addition to being active, she is also accident prone. We have a hard, marble fireplace with a matching seating area that we use to put her toys on. The fireplace is unoperable and is locked behind a see-through door, so no worries there. The fireplace has sharp corners, and there were numerous close calls. We decided to head to Walmart and purchase corner and edge covers. While the covers certainly don't add any aesthetic appeal to our once beautiful fireplace, it's a sacrifice we were 100000% willing to do. She has hit her head on the sides since we placed the covers, and she only suffered from minimal crying. We also had some silly moments when it comes to baby proofing. Isabella is now three years old and is into more things now than ever. We allow her free range of the home. No gates other than the one at the top of the stairs so she doesn't roam the downstairs while I'm asleep. One day about a month ago, I waltz into the kitchen and see that she has taken out every single slice of bread that was in our fresh loaf. No, we didn't eat it, although my grandpa is a firm believer in not wasting anything. We then placed our loaves of bread in a cabinet, out of her reach…for now. 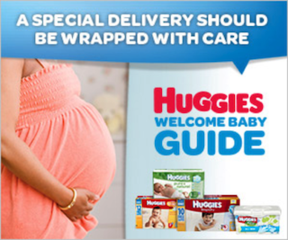 My favorite disposable diaper brand is HUGGIES®. They have products specifically designed for the active babies in our lives who always seem to be getting into something. Or, as I like to call them – ninja children. All of these HUGGIES® products are available at Walmart for your convenience. Reasons Why You and Your Dog Should Go to Your Local Dog Park + How to Help Improve Yours!